Join this day tour from Madrid to discover the old city of Toledo, located on a mountaintop with a 150 degree view and surrounded on three sides by a bend in the Tagus River. 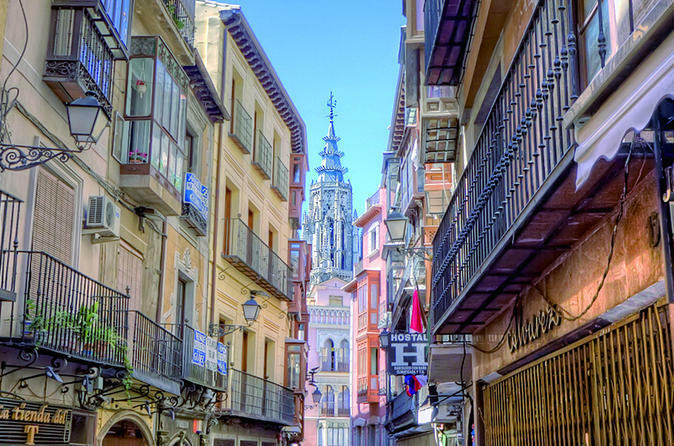 Toledo contains many historical sites, including the Alcázar, the cathedral (the primate church of Spain), and the Zocodover, a central market place. Toledo is located 70 km (44 miles) south of Madrid and was declared a World Heritage Site by UNESCO in 1986 for its extensive cultural and monumental heritage and historical co-existence of Christian, Muslim and Jewish cultures. Toledo is known as the "Imperial City" for having been the main venue of the court of Charles I, and as the "City of the Three Cultures", having been influenced by a historical co-existence of Christians, Muslims and Jews. It has a history in the production of bladed weapons, which are now popular souvenirs of the city and it was also the place of important historic events such as the Visigothic Councils of Toledo. Upon arrival we start with a panoramic walking tour to the old city to visit the inside of the monumental Primate Cathedral, a magnificent sample of Gothic style, and later through the old Jewish quarter with its narrow streets to visit the Church of St.Tomé, with the very famous painting of El Greco “The Burial of Count Orgaz”, the old Synagogue of Ste. Maria la Blanca which remain as a symbol of the coexistence of “Three Cultures”, Monastery of San Juan de los Reyes and Cristo de la Luz Mosque. Concluded with a panoramic bus ride around the outskirts with a short stop to admire the views from the other side of the river and take photos. We’ll also visit a typical factory of Damasquino, a well known handicraft art of Toledo.